We are so glad to see you! We have to say, our 2018 Crop looks good this year! We have pumpkins galore for feasting on or using as decorations! Not to mention a store full of goodies! variety of activities for the entire family! McLemore Pumpkin Farm, owned and operated by Bob and Aquilla McLemore, is located in the SW part of Oklahoma State (Washita County) near the town of Colony. Farming is our livelihood so you are in for a treat coming to the farm, because you never know what new baby animals we will have for you to see. 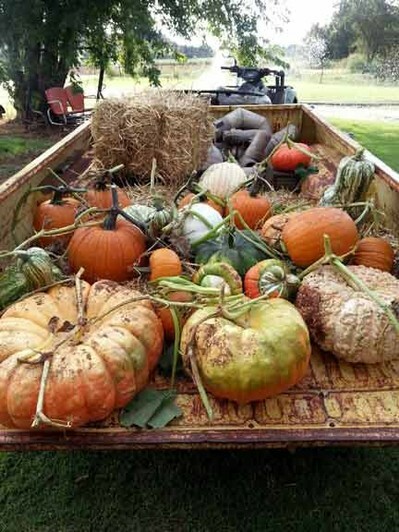 We have a field of pumpkins where you can pick your own or for those who just "like to shop" we have several varieties of fresh cut pumpkins, gourds, hay bales and yard decorations. There are places for papas, nanas and parents to sit and watch their children play and enjoy the fall season in the country. Come experience the thrill of chicks, ducklings or whatever "babies" we have running around. There is a new batch each year, so there's no telling what you may see! Take a stroll around the farm while you choose your favorite pumpkin to take home. There are a variety of shapes and sizes! We also carry natural beef and a variety of fresh vegetables (seasonal). Click here for current product list at the Pumpkin Farm Store! We are currently taking reservations, so give a call or e-mail us!